The most efficient outdoor kitchens are ones that are just as functional as indoor kitchens. Some outdoor kitchens can be very simple; only having the essentials. However, some outdoor kitchens require a professional designer for assistance in design and installation. 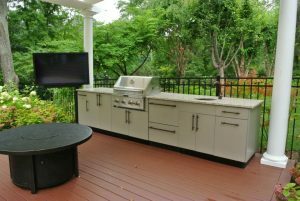 Regardless if you choose to hire a professional or not, here are things to keep in mind when designing your outdoor kitchen. Be sure the materials you choose are designed to withstand the elements (extreme heat, snow, heavy rain and wind) and are easy to clean and maintain. Known for its durability, high quality stainless steel is a popular choice because it is easy to clean, corrosion-resistant and durable. The products you choose will need to be able to withstand temperature changes, as well as be waterproof. Installing an outdoor kitchens provides you with a place to cook and entertain your family and friends. Be sure to plan for shade and shelter in case of rain, as well as to make things more comfortable in the hot summer months. You can incorporate an umbrella in seating areas or a pergola to provide more shade. Many homeowners are even installing outdoor ceiling fans to provide more comfort during the hot days of summer. Also consider incorporating a fire pit to create a warm spot for the cooler evenings and months. Adding outdoor lighting can help your outdoor space be more inviting for your guests, truly making this retreat an extension of your living space. It will also help make food prep and cooking easier and much safer. If you have incorporated a pergola in your design, a light can be installed from the ceiling. You can also consider installing light fixtures behind the work space or incorporating pole lights. Lighting not only extends your time outside, but provides safety for walkways, cooking areas and staircases. 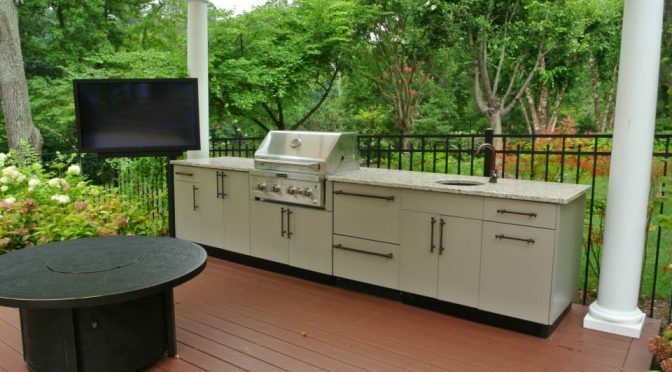 There are several factors that need to be considered when choosing a location for your outdoor kitchen. You’ll want to assure smoke from the grill doesn’t go back into your home. With this in mind be sure to put the grill in a place that is a proper distance from your home. Another consideration is whether or not the view from inside your home is important to you and your family. If so, consider putting the outside kitchen at an angle so the view isn’t blocked. It’s also imperative to consider the other areas of your yard that are already established. Do you have children or pets? The hot grill shouldn’t be placed next to children’s play equipment or an area your pet is prone to play in. Finally, consider placing the outdoor kitchen in close proximity to your indoor kitchen. Sometimes there are occasions when you may need to use both kitchens simultaneously. It also makes hauling everything from the indoor kitchen outside, and back inside again much easier. The appliances you choose to have outside will need to be even more durable than the ones that are normally used for inside kitchens. Stainless steel and ceramic appliances are durable and require low maintenance. By choosing the right appliances and materials, considering the location of your outdoor kitchen and your families needs, you can extend your living space and provide an all inclusive spot to entertain. Depending on the size of the space that you have available, it may be best to call in a professional for advice and suggestions.